As a major step in the phased reinstallation of its collections, two years ago the museum unveiled the newly reinstalled lower-level galleries of the eastern half of the 1916 building. Included in that unveiling was the suite of early medieval galleries featuring Early Christian, Byzantine, and Western medieval art through about 1300. The balance of the medieval holdings, including works up to about 1500, plus Renaissance and Islamic art, are currently being installed in new galleries in the western portion of the same floor, across from the Plain Dealer Lobby, with a planned opening in December. Many of these late medieval treasures, including sculpture, stained glass, panel painting, illuminated manuscripts, and tapestries, will return to view after an absence of seven years. The new installation will include signature objects that define the museum’s medieval collection as one of the most important internationally. The character of the collection reflects works that are either unique to Cleveland or else not readily duplicated in other museums. 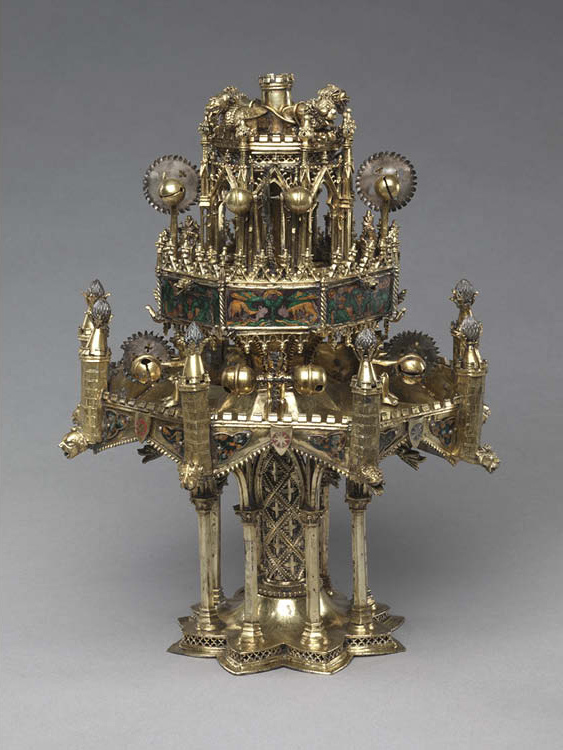 One of the most emblematic works is the Gothic table fountain dating to 1320–40. This rare object is the most complete example of its type known to have survived from the Middle Ages. Medieval inventories show that such small fountains, generally made from precious metals, once existed in large numbers. Some must have been made for temporary use and linked to a particular great ceremonial or social event. The museum’s fountain is an exquisite piece of Gothic architecture in miniature. Originally, it stood in a large catch basin. Scented water, pumped through a central tube, would have emerged at the top through a series of nozzles creating water jets. These in turn forced rotation of the water wheels and rang the tiny bells. Such fountains likely were mounted on tripods or small side tables to be admired for the beauty of their craftsmanship. As feats of technical ingenuity, they were intended to entertain guests through the motion of cascading water and the accompanying sound of ringing bells. The museum’s sumptuous fountain illustrates a type of object that was much loved by the Valois princes of France, including the dukes of Burgundy. Such objects embodied aristocratic values: magnificence in appearance, ceremony, and surroundings. Splendid goldsmith work, illuminated manuscripts, tapestries, music, and pageants were emblematic of status, wealth, and power. During the late Middle Ages, the dukes of Burgundy were the wealthiest and most powerful aristocrats in northern Europe, controlling an expanse of territory that included all of modern Belgium and much of northern France. The dukes commissioned sculptors and painters of great renown to decorate and celebrate their magnificent court in Dijon. 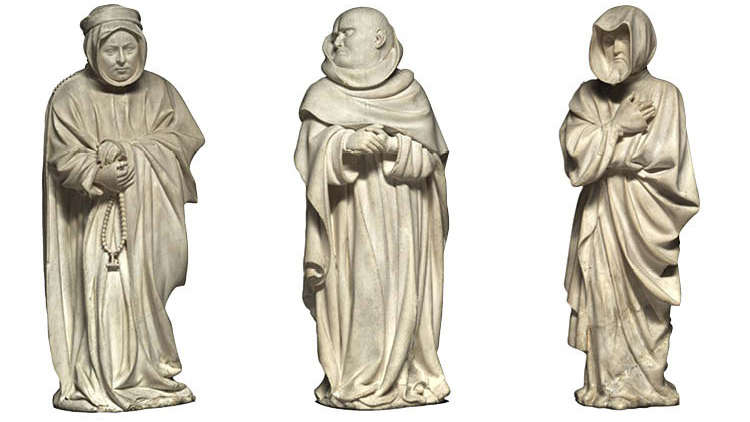 Returning to display in the newly installed galleries will be the fabled mourners from the tomb of Philip the Bold, Duke of Burgundy (1364–1404), of which the museum has three. These small alabaster statuettes known as mourners have evoked a sense of awe and mystery as well as curiosity and admiration throughout most of their history. Forty-one such mourners were originally arranged in processional rank around the sides of the ducal tomb within a marble arcade in a Carthusian monastery, the Chartreuse de Champmol, near Dijon. The mourners, realistically carved by the court sculptor Claus de Werve, remain the most famous elements from Philip the Bold’s tomb. Highly individualized (no two are alike), they retain minute details of costume and facial features. The faces of some are almost portrait-like in their depiction of facial creases and expression, as if to suggest actual individuals, while the faces of others are fully or partly obscured by their cowls. The tomb of Philip the Bold is celebrated as one of the most sumptuous and innovative of the Middle Ages. Philip planned early and commissioned his tomb in 1384 from his court sculptor, Jean de Marville. The design featured two large slabs of black marble. The upper slab supported a prominent effigy of the duke lying in state between figures of flanking angels, while between the slabs was an intricate open arcade filled with the 41 remarkable alabaster mourners. Though the tomb’s design and initial construction was the work of Marville, responsibility passed to Claus Sluter after Marville’s death in 1389. After Sluter’s own death in 1406, work continued on the tomb by his nephew Claus de Werve until the project’s completion in 1410. The tomb was destroyed during the French Revolution, though the mourners and other fragments have been preserved. Cleveland’s mourners are the only extant fragments of the tomb outside of Dijon. The late Middle Ages witnessed the rise of strong, royalty-based nation states, particularly the kingdoms of England and France, and the Christian kingdoms of the Iberian Peninsula (Aragon, Castile, Navarre, and Portugal). Trade continued to flourish and towns prospered. Art for public and private devotion formed an important export market. During the Age of Discovery, Europeans, led by the Portuguese and Spanish, and after 1495 by the French and English, established contact with Africa and the Americas. One of the towering patrons of art in Spain was Queen Isabella the Catholic (reigned 1474–1504). 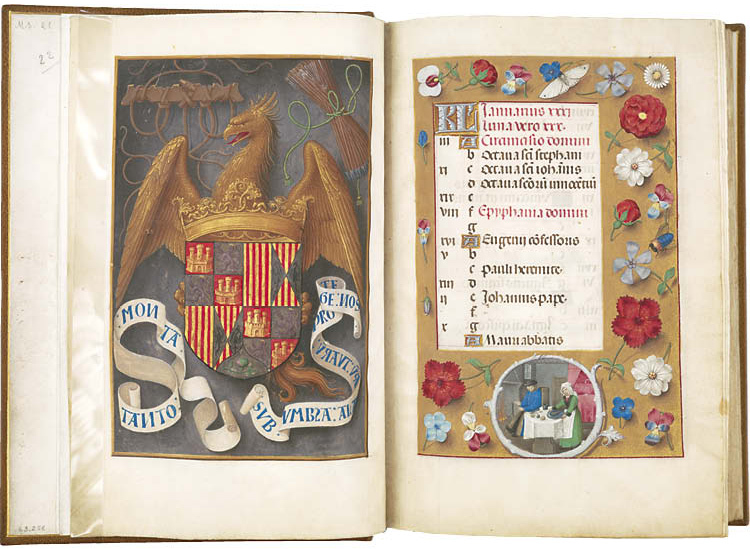 Among the great masterpieces of medieval manuscript illumination is the sumptuous and exceptionally preserved book of hours once owned by Isabella. This deluxe manuscript was intended not for a cleric, but for the private devotions of a layperson. Isabella’s coat of arms and personal motto embellish the book’s frontispiece, establishing her ownership of the volume. It was likely presented to her as a gift, though the circum-stances of this transfer remain unknown and undocumented. A great lover of Flemish art, Isabella is known to have treasured her many devotional books. They were largely kept in her private library at the palace, the Old Alcazar, in Madrid where they would have been available for use in her private chapel. With her husband, Isabella was granted the title of Catholic Monarch by Pope Alexander VI, of whose secularism Isabella did not approve. Along with the physical unification of Spain, Isabella and Ferdinand embarked on a process of spiritual unification, trying to bring the country under one faith, Roman Catholicism. Isabella was extremely pious and orthodox, and as a result commissioned much religious art for private use in her residences and private chapels. distinctly talented manuscript painters active in the two Flemish cities of Ghent and Bruges at the close of the 15th century. The Ghent-Bruges school represents the culmination of Flemish book painting, whose products were widely exported. Its main features were the use of rich colors, decorative and illusionistic effects, a love of landscape, and a strong sense of visual narrative. Manuscripts produced by this circle of artists are renowned for the decoration of their borders, which typically feature a rich variety of realistically painted flowers, scrolling acanthus leaves, birds, and butterflies. This distinctive innovation in border decoration emphasized realistic motifs that cast shadows onto colored grounds to create atrompe l’oeil effect. In Germanic central Europe during the close of the 1400s, the emperor and his court, as well as members of the nobility and the clergy, remained the most important patrons of the arts and architecture during the waning years of the Middle Ages. In addition, the economic boom experienced by many German cities created a new class of patrons that consisted of merchants and burghers, as well as guilds and confraternities. Looking for opportunities to display their wealth, piety, and pride, they furnished churches and private chapels with cycles of stained-glass windows, devotional sculptures, or painted altarpieces commissioned from the most accomplished artists of the period. Two sculptures by the German master Tilman Riemenschneider will highlight the new gallery dedicated to Late Gothic Germany and Austria. 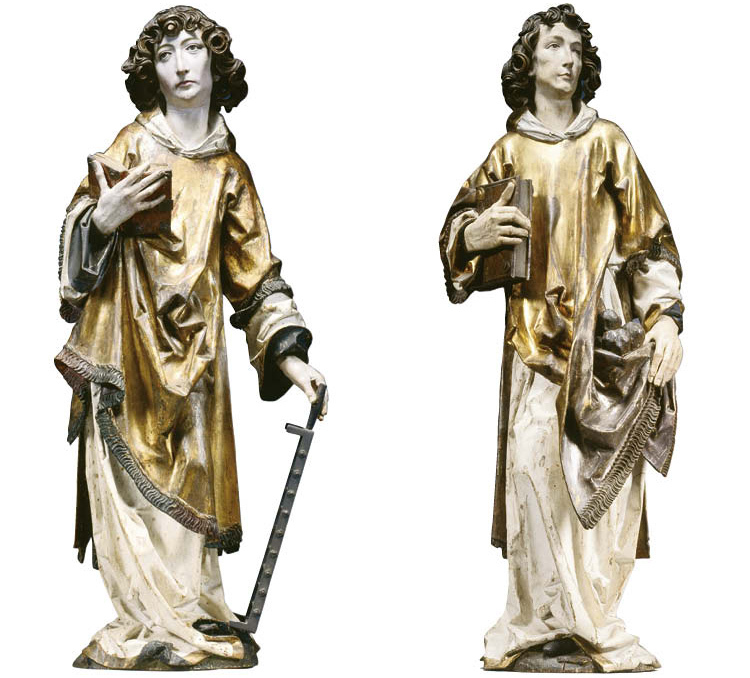 These sculptures, representing Saints Stephen and Lawrence, along with two female saints preserved in Frankfurt (Historisches Museum), are believed to be the only remaining fragments of a large altarpiece carved by Riemenschneider for the Dominican convent in Rothenburg in Franconia (demolished in 1813). Each saint wears a dalmatic (wide-sleeved robe) to indicate his status as a deacon in the early Church, and each holds a symbol of his martyrdom—St. Lawrence a grill and St. Stephen some stones—to indicate their deaths by burning and stoning. Art in Germany through the early 1500s remained firmly anchored in the Gothic style with its associated interests in realism. Riemenschneider—a recognized master in both stone and wood—was one of the most prolific and versatile sculptors of this style, his flourishing workshop employing as many as 40 apprentices in sculpting, woodcarving, and painting. He became a wealthy landowner in Würzburg, eventually rising to councilman and mayor. Noted for their dreamy, melancholic, and introspective quality of expression, Riemenschneider’s sculptures display remarkable attention to detail. These and other important works from the collection will prove a visual feast in their new and refreshed settings. During their time off display, many were conserved and cleaned to ensure they look their best. New works of art acquired during the intervening years will be introduced in December. The new galleries will undoubtedly prove to have been well worth the wait.